Pantone constantly strives to manufacture its products at the highest level of quantity possible, but the fact is that over time, all papers will yellow and dyes will fade. In order to ensure you have the most accurate color for specification an evaluation, Pantone recommends that you replace your guides and books annually. Pantone also regularly introduces new colors into the PANTONE FASHION, HOME + INTERIORS Color System. The colors that are added are based on the latest research by the PANTONE COLOR INSTITUTE into market direction and trends – in other words, the colors you and your clients want. Make certain you don’t come up short on the latest colors available with the most up-to-date PANTONE Publications. 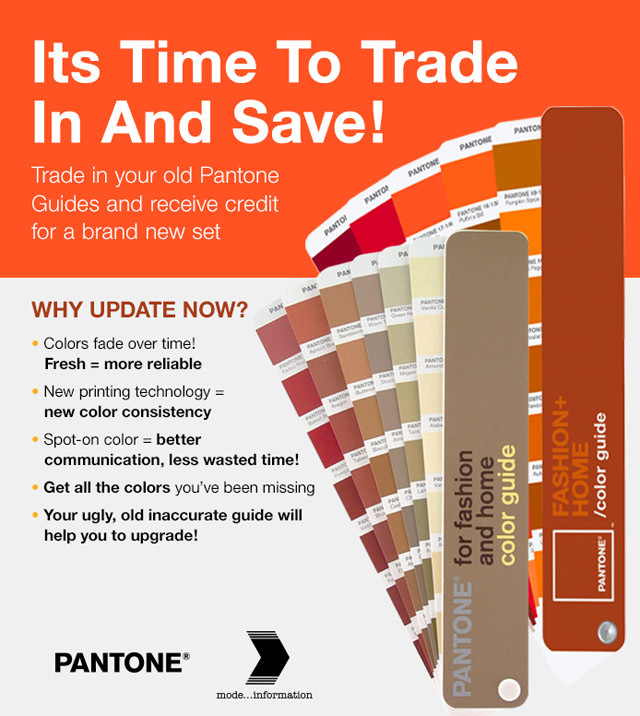 In other words, without the latest guides and books from Pantone, you could be losing money, time – and clients. How to get your rebate? It’s easy! 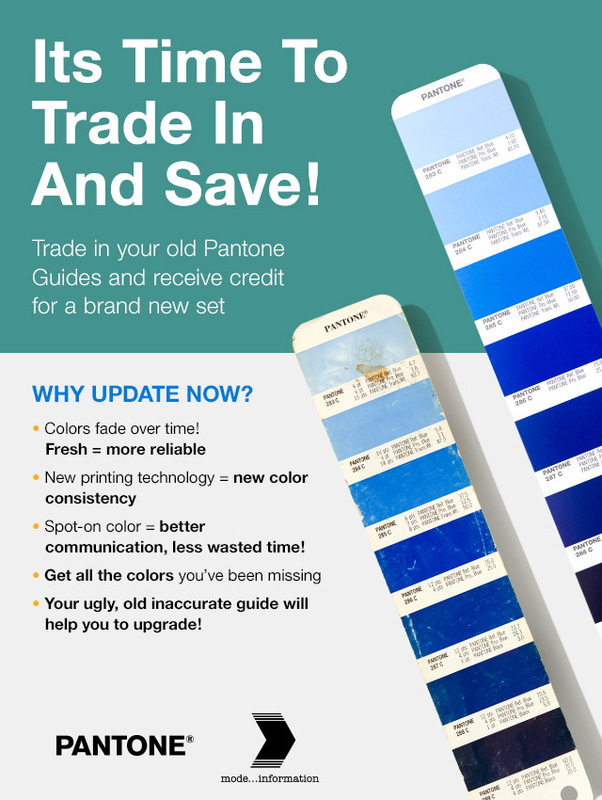 Return your eligible, outdated PANTONE FHI product back and purchase the same up-to-date product or another eligible PANTONE FHI Guide or Book with a higher value to benefit of the Trade in refund value of the old product. Trade in any FHI Color guide and get a £ 25 rebate on the purchase of any new FHI product mentioned above. Trade in any FHI Cotton passport and get a £ 90 rebate on the purchase of any new FHI product mentioned above, excluding the FHI Colour guide. Trade in any Colour Specifier and Guide TPG Set and get a £ 100 rebate on the purchase of any new FHI product mentioned above, excluding the FHI Colour guide and FHI Cotton passport. Trade in any Cotton Planner and get a £ 130 rebate on the purchase of a new FHI Cotton Planner, Cotton Chip Set or Cotton Swatch File. Trade in any Cotton Chip Set and get a £ 260 rebate on the purchase of a new Cotton Chip Set or Cotton Swatch Library. Trade in any Cotton Swatch File and get a £ 875 rebate on the purchase of a new Cotton Swatch Library.